Boston Whaler 27’ Guardian: This boat is a commercial duty boat manufactured for the U.S. Navy and various other government agencies. It is extremely heavy duty and designed to be able to navigate in both shallow and deep waters. We feel very comfortable both fishing the surf zone along the rocky shore or in the deep waters off the edges of the banks. We have customized this boat to suit the needs of our clients and our fisheries. The “Orca’s” 10’ beam gives clients plenty of room to spread out. Our fully equipped tower allows us to find and see fish other boats cannot. We have a full complement of Raymarine top of the line equipment at both steering stations. Satellite weather, color video screens for radar, charts and depth sounder give us the most accurate and up to date information available on the water. Our twin Yamaha 225 four-stroke engines are the best motors available on the market. We have used Yamaha products for the past 20 years with great success. Our inshore boat is a 20’ Maritime Skiff powered by a single Suzuki 115 four-stroke motor. This boat is also equipped with the latest technology from Raymarine. 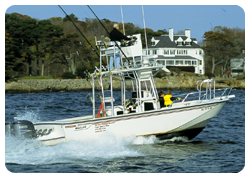 This boat is the perfect vessel for exploring the backwaters and salt marshes around Cape Ann as well as fishing the rocky surf along the extensive shoreline. We will be running our 4 hour “Bass Class” on this boat during the summer of 2009. Copyright © 2009 On-Line Fishing Charters. All Rights Reserved.